↑ "President". The President's Office - Republic of Maldives. Retrieved 17 ᱱᱚᱵᱷᱮᱢᱵᱚᱨ 2018. ↑ "Field Listing: Area". CIA World Factbook. CIA World Factbook. Retrieved 27 ᱡᱟᱱᱩᱣᱟᱨᱤ 2016. 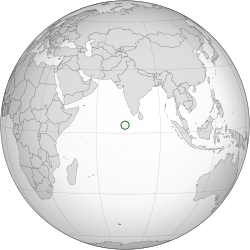 ↑ "GeoHive – Maldives Population". GeoHive. Archived from the original on 25 ᱯᱷᱮᱵᱽᱨᱩᱣᱟᱨᱤ 2015. ↑ ᱙.᱐ ᱙.᱑ ᱙.᱒ ᱙.᱓ "Maldives". International Monetary Fund. Retrieved 23 ᱮᱯᱨᱤᱞ 2018.